The sewing machine that Hartney used to sew the gowns was originally owned by Hartney’s grandmother. 2015. In response to the increasing maternal mortality rate and instances of postpartum PTSD and obstetric abuse in the United States, artist Michelle Hartney has organized a performance entitled “Mother’s Right” to take place on September 7 in Daley Plaza. The performance is a part of a national day of rallies taking place on Labor Day across the nation, organized by the Improving Birth movement to call attention to problems and solutions in maternal health care. Hartney has sewn 1,200 “hospital gowns,” one for every mother who died in childbirth in America in 2013. Made of fabric that has been silk-screened by artists Erin Chlaghmo, Andrew Reyes, Orr Gidon and Printed Chicago, the design is composed of tiny drawings of plants used to create drugs that have been used on laboring women for the past 150 years. During the performance, pairs of women will fold the silkscreened gowns into triangles, in the manner that the American flag is officially folded. According to the American Legion, the traditional flag-folding ceremony includes twelve symbolic folds, with the ninth fold symbolizing womanhood. The gowns have been cut to a length that only allows nine folds. The artist is seeking thirty-five women to take place in the performance through an open call on her website. 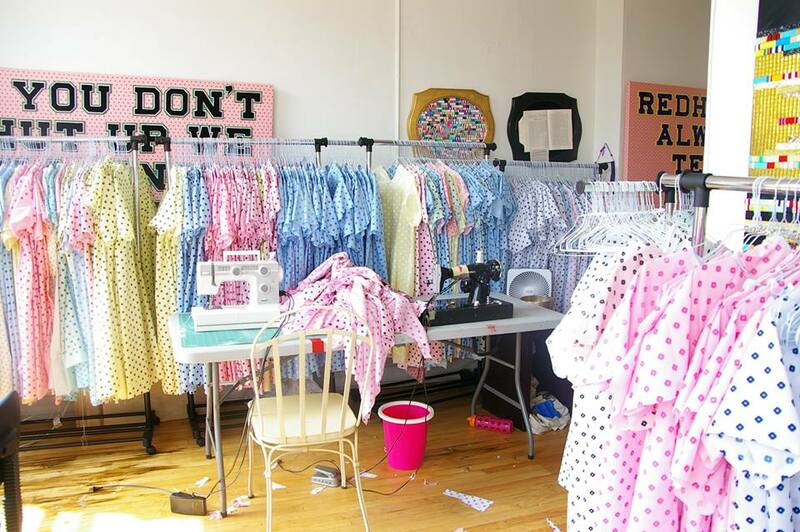 Hartney’s studio during the making of the hospital gowns, 2015. According to the World Health Organization, the maternal mortality rate in the United States has increased 250 percent since 1995, making it the highest maternal mortality rate in a developed country. African-American women are four times more likely to die in childbirth than Caucasian women. “Mother’s Right” will take place on September 7 in Daley Plaza, 50 West Washington.